Ever wondered how to pan-fry a steak with a charred crust and an interior that's perfectly medium-rare from edge to edge when you cut into it? How to make homemade mac 'n' cheese that is as satisfyingly gooey and velvety-smooth as the blue box stuff, but far tastier? How to roast a succulent, moist turkey (forget about brining! )—and use a foolproof method that works every time? As Serious Eats's culinary nerd-in-residence, J. Kenji López-Alt has pondered all these questions and more. 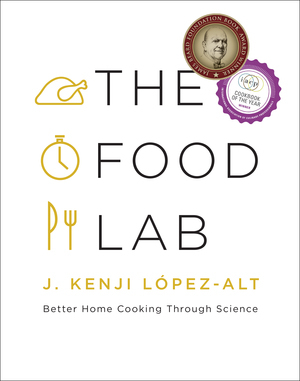 In The Food Lab, Kenji focuses on the science behind beloved American dishes, delving into the interactions between heat, energy, and molecules that create great food. Kenji shows that often, conventional methods don’t work that well, and home cooks can achieve far better results using new—but simple—techniques. In hundreds of easy-to-make recipes with over 1,000 full-color images, you will find out how to make foolproof Hollandaise sauce in just two minutes, how to transform one simple tomato sauce into a half dozen dishes, how to make the crispiest, creamiest potato casserole ever conceived, and much more.